Knitting is the process of using two or more needles to loop yarn into a series of interconnected loops in order to create a finished garment or some other type of fabric. The word is derived from knot, thought to originate from the Dutch verb knutten, which is similar to the Old English cnyttan, to knot. Its origins lie in the basic human need for clothing for protection against the elements. More recently, hand knitting has become less a necessary skill and more a hobby. Most histories of knitting place its origin somewhere in the Middle East, from there it spread to Europe by Mediterranean trade routes, and then to the Americas with European colonization. The earliest known examples of knitting have been found in Egypt and cover a range of items, including complex colorful wool fragments and indigo blue and white cotton stockings, which have been dated between the 11th and 14th centuries. Who invented knitting? Was it a sage or a shaman who one day picked up two sticks, some string, and began the incredible act of knitting? Was this ancient genius filled with divine inspiration or dark magic? Could it have been a lucky accident? Researching the history of knitting, we expect legends and myths and maybe a few charming fairy tales. What fun it would be to discover Rumpelstiltskin-like stories about maidens in dire straits, knitting late into the night! After all, the ancient and similar craft of weaving is central to dozens of myths and legends. Take, for example, Penelope from Homer’s Odyssey. While her husband Odysseus was off fighting the Trojan War, she fended off lovestruck suitors with a bargain: she would choose a new husband when she finished weaving a shroud. She then wove the shroud by day and undid it by night, delaying her answer until Odysseus finally returned. However, unlike spinning or weaving, knitting doesn’t figure in any ancient myths. In fact, there isn’t even an ancient Greek or Latin word for knitting! The word “to knit” didn’t make an appearance in the Oxford Unabridged English Dictionary until the fifteenth century and wasn’t part of any European language until the Renaissance. All this confirms that knitting is a relatively new invention. Whereas knitting uses two needles to make loops within loops with string, nålbinding uses one needle to splice and knot string together – a process more akin to sewing. However, both knitting and nålbinding produce near-identical looking fabric. The reason the two are so similar is because knitting may have grown out of nålbinding. At some point, a nålbinder might have introduced a second needle into the work and played around until the nålbinding evolved into knitting. The first genuine knitted pieces are from Egypt, circa 1000-1400 AD (much later than the nålbinded garments). They include some colorful fragments and intricate socks (sometimes called Coptic socks) knit in white and indigo cotton. The popularity of knitting showed a sharp decline during this period in the Western world. Sales of patterns and yarns slumped, as the craft was increasingly seen as old-fashioned and children were rarely taught to knit in school. 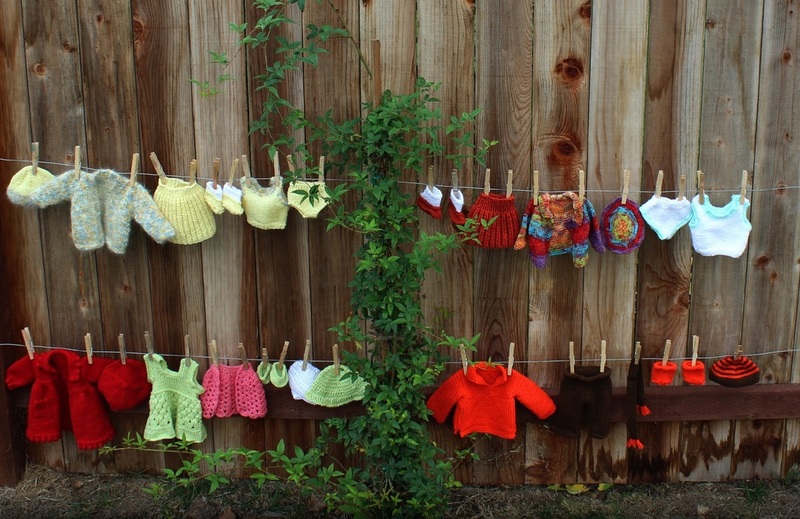 The increased availability and low cost of machine-knitted items meant that consumers could have a sweater at the same cost of purchasing the wool and pattern themselves, or often for far less. Alternatives to traditional woolen knitwear gained in popularity, such as tracksuits and sweatshirts which began to be worn as everyday wear rather than only in a sporting context. Sewn from a micro-knit synthetic fabric and brushed on one side, these were more fashionable at the time, much cheaper and quicker to produce and for the consumer much more easily cared for. These fabrics could also easily be printed with fashionable designs. Although made from a kind of knit fabric they are not usually considered knitwear. These new garments, along with trends away from formality in clothing meant traditional knitwear was no longer seen as sportswear such as it had been in the 1920s. Knitwear became associated more as "smart casual" wear. Technological advances such as computerized knitting machines saw new designs and approaches to knitting. Some artists began to see knitting as a legitimate art form rather than a craft or cottage industry and more attention began to be placed on the design possibilities of knitting from an artistic perspective rather than wholly fashion (or practical) approaches. A slipknot is the first step in starting most knitting projects. To begin, let the tail of the yarn hang in front of your palm, and loop the yarn loosely around the first two fingers of your left hand. Pull the yarn attached to the ball underneath the yarn behind your fingers and then through the loop. Hold the tail of the yarn in your left hand and the newly made loop in your right hand. Pull the tail to tighten, and make a slipknot. You have your needles and yarn, and you've made a slipknot. 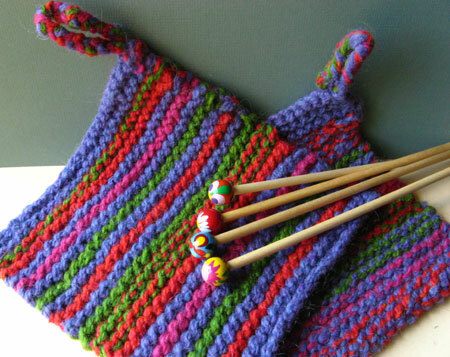 Here's how to get the first stitches onto the knitting needles. Holding the knitting needle in your right hand, slide the newly made slipknot onto the knitting needle. Pull gently on the yarn to tighten the slipknot so it doesn't fall off the needle. Lay the yarn attached to the ball in your left hand, slipping it around your thumb and holding it in place with the fingers of your left hand. Arch your thumb slightly to create a little tension. Move the needle to the right of your left thumb, and then slip the needle tip under the strand of yarn that is in your palm. Let the yarn slip off your thumb, and pull gently on the yarn to tighten the new stitch on the needle. Repeat steps 2 through 4 until you have the number of stitches you need to cast on, as indicated by your project instructions. Now you're ready to continue with one of the two basic stitches, the knit or purl stitch. Knit stitch: With yarn in back of the work, insert right-hand needle from front to back into first stitch on left-hand needle. Notice that right-hand needle is behind left-hand needle. Form loop by wrapping yarn under and around right-hand needle. Pull loop through the stitch so loop is in front of the work. Slip first of "old" knit stitch over and off the tip of left-hand needle, leaving it on right-hand needle. Purl stitch: With yarn in front of the work, put right-hand needle from back to front into first stitch on left-hand needle. Form loop by wrapping yarn on top of and around right-hand needle. Pull loop through stitch to make a new purl stitch. Slip first or "old" purl stitch over and off tip of left-hand needle, leaving it on right-hand needle. Increasing: Insert the right hand needle (RHN) into the front of the first stitch on the left hand needle (LHN), and complete a knit stitch by wrapping the yarn around the needle and pulling it through the stitch on the LHN. However, do not slip the first stitch off the LHN. Carefully insert the RHN into the back of the same stitch you just knitted, as shown in the illustration. Complete this knit stitch by wrapping the yarn around the needle and pulling it through that same stitch on the LHN. With the two new stitches securely on the RHN, slip the first "old" stitch off the LHN. You have just increased one stitch. Slip-stitch decrease: This decrease appears on the knit side of your work and is usually used on the right edge of the row. It's often abbreviated as "sl1, k1, psso" and sometimes as "SKP." Both stand for the same technique, which is "slip 1 stitch, k 1 stitch, then pass the slipped stitch over." Slip one stitch as follows: With your yarn in back of the work, put the RHN from back to front into the first stitch on the LHN as if you were going to purl the stitch. Without doing anything with your yarn, carefully slip that first stitch from the LHN onto the RHN. Knit the next stitch. Pass the slipped stitch over as follows: On the front of your work, put the LHN from left to right into the second stitch (the slipped stitch) on the RHN. Lift this stitch over the first stitch (the previous knitted stitch) on the RHN, and then over the tip of the RHN; let it drop completely off both needles. You have just decreased one stitch. Working two stitches together: This decrease appears on the knit side of your work and is usually used on the left edge of the row. It also can be worked on the purl side of your work. It's often abbreviated as "k2tog" or "p2tog." Normally, you would insert the RHN into the first stitch on your LHN. In this case, skip the first stitch completely, and put the RHN into the second stitch and at the same time into the first stitch on the LHN. Notice that the RHN is now through two stitches. Complete the knit stitch by wrapping the yarn under and over the RHN and carefully pulling it through both stitches. Allow the two stitches to slip off the LHN; let the new single stitch remain on the RHN. You have just decreased one stitch. To purl two stitches together, put the RHN into the first stitch on the LHN as if you were going to purl the stitch, and at the same time insert it into the next stitch on the needle. Complete the purl stitch as you normally would, carefully pulling the yarn through both stitches. Slip the two stitches off the LHN, and let the new single stitch remain on the RHN. You have just decreased one stitch. This increase appears on the knit side of your work. Knit two together (K2TOG): Decreased stitch slants to the right. Working from left to right at the point of the decrease, insert tip of right-hand needle into second and then first stitch on left-hand needle; knit two stitches together. Purl two together (P2TOG): Decreased stitch slants to the right. Working from right to left at point of decrease, insert tip of right-hand needle into first two stitches on left-hand needle and purl two stitches together. Slip, slip, knit (SSK): Decreased stitch slants to the left. As if to knit, slip next two stitches from left-hand needle one at a time to right-hand needle. Insert left-hand needle into these two stitches from back to front, and knit them together from this position. Here's the technique you need when your knitting pattern calls for a change of color: Drop the color you've been working with behind your work. Insert the RHN into the next stitch, then pick up and lay the old color on top of the RHN. Let it lie there as you pick up the new color with your left hand, and wrap it under and around the needle as if you were going to knit the stitch. Before completing the knit stitch, push the old color off the top of the needle, then complete the knit stitch with the new color. 1. Watch the videos on basic knitting provided here. 2. Obtain the basic materials for your projects: Needles (any), yarn (solid color yarn) or as wanted. 3. Make a head band as instructed in the video #1 or using your own design. 4. Make a dishcloth as instructed in the video #2 or using your own design. 5. Submit photos of completed art projects, comments and questions. Please submit photo(s) of completed art project(s), comments and questions via the online form or via email.